Almost every day before a game at Kauffman Stadium, the baseball scouts gather at one end of the press box. They sit and they talk, and very often, Art Stewart is at the center of the group, telling stories. Stewart has a lot of stories to tell, because at 87, he’s been scouting in seven decades. He’s a great storyteller and that’s why it’s our good fortune that he’s decided to put his tales in a book, “The Art of Scouting,” being published on Thursday by Ascend Books. What co-author Sam Mellinger, a Kansas City Star columnist, has done so well is capture the cadence, the spirit and the enthusiasm of Stewart. It’s like you’re sitting right there with the scouts, listening to ol’ Art tell a story. Or two or three. In the last few BookNotes I’ve introduced you to some pretty serious books – from old theology to new liturgy, from a good, young writer talking about hard times to a respected older writer talking about God’s divine conspiracy. Soon I’m going to share an important list of books about some very heavy stuff, so for today I’m going to tell you about the feel-good book of the summer. Interestingly, fun as it is, it includes some data about, and reveals a huge heart to work against sexual trafficking and modern day slavery. I’m glad to say that even though it has a sub-theme about justice, it is about that quintessential American game, baseball, but, even more, about the simple joy of having a game of catch. 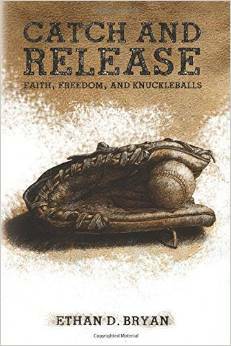 Catch and Release: Faith, Freedom and Knuckleballs is truly delightful, an enjoyably nice read, and at times, even stirring. I’ll admit, one touching chapter just slayed me and I closed the book, happy about the ending, but wishing for more. I loved this book about playing catch and trying to bring release to the captives.